Puredental in EastBank Street offer dental bridges amongst a wide range of dentistry services. If you’re considering dental bridges Southport based Puredental can advise you on best practices as well as on our procedure. Appearance is one of the main reasons why people replace missing teeth. Another perhaps better reason is that the gap left by missing tooth can mean greater strain on the teeth at either side. A gap can also mean your ‘bite’ is affected, because the teeth next to the space can lean into the gap and alter the way the upper and lower teeth bite together. This can then lead to food getting packed into the gap, which causes both decay and gum disease. A dental bridge is not the only alternative when it comes to replacing teeth. Some people prefer to have a removable false tooth or teeth – known as a partial denture, as opposed to a fixed bridge. A bridge is usually used where there are fewer teeth to replace, or when the missing teeth are only on one side of the mouth. The main benefit of a bridge of course is that it is a permanent fixed solution to closing a gap. 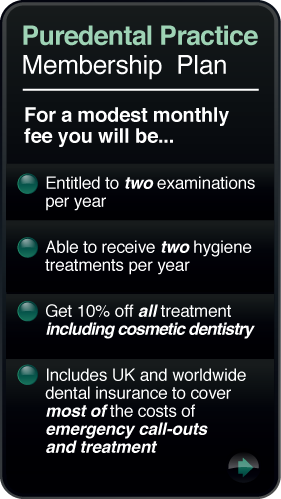 If you’d like to know more, pop into our dental boutique in Southport and we’ll be glad to advise you.